I grew up with a crafty father. My dad who I happen to call Pete, in which Pete is not his name. His name is actually Greg, but I prefer to call him Pete. My dad is a visionary, he can see a fishing lure in a piece of drift wood. A gate out of old metal head boards, and a greenhouse out of salvage windows. My Dad is famous for dumpster diving and picking things up from the curb. In one man’s trash he sees potential. Potential for something great or it just collects dust in the garage. My sister and I grew up in a home that was filled with antiques and other questionable items that should have died in the seventies. Example “who has a couch with bridges and trees on it?” My parents, that’s who. Anyways, My dad spent his spare time teaching us that we could make everything out of nothing. I watched as my Pete carved fishing lures, built tackle boxes, and many other countless creations. He once made a swinging grill for the fire pit from an old fan grate, a chain, and a metal fence post. It worked beautifully and provided us with many grilled hot dogs. Little did I know that Pete was instilling in me a never-ending desire to create and to contribute to the world around me. In high school I dabbled in clay, my projects line the shelves and walls of my parents home. Painting and drawing are not my forte, yet clay captured me, it allowed me to create and convey my emotions to the world. I haven’t worked with clay for years. I actually stopped creating and found myself thrown into the black and white world of corporate life. My soul needed to create again. Writing soothed me and allowed me to share my story, yet my heart it wanted to look upon my latest DIY project. Last summer with the help of Pete I turned two side tables into a padded topped bench, an IKEA table went from light blue, to berry, and my black lamps were painted the perfect shade of apple green. My heart was happy, my hands were creating again and I felt whole. One night I was once again on my never-ending quest to find the best subscription boxes on earth, when I came across Darby Smart. 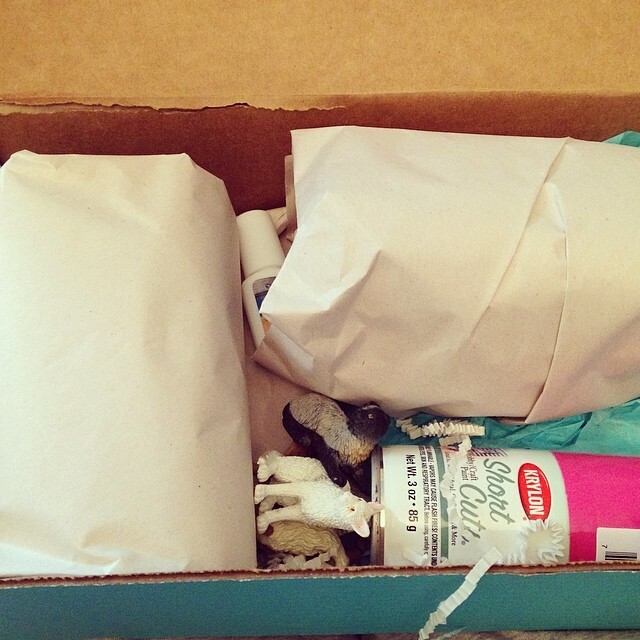 Darby Smart sends you delightful DIY Kits. When you open your kit, we want your eyes to twinkle. When you finish your kit, we want you to feel proud. To achieve that, we work hard to find uniquely chic materials. We obsess on writing fun, simple instructions. I am on my third Darby Smart Kit (I know, I know, I have been holding out on you), I am in love with this company. Darby Smart has a diverse selection of kits. They have one to tickle every fancy and to satisfy every whim. Darby Smart customer service is amazing, orders are processed at lightning speed, and are on your door step faster than you can spell MISSISSIPPI. I have always seen mason jar canisters in the store with embellishments on the lid. I just didn’t want to fork over $10 to $30 dollars for one. I knew I could probably make one, yet I was too lazy to go out and gather all of the needed supplies. Enter Darby Smart, they have an Animal Canister kit for $19.00 and I had a $15.00 of coupon. Which made my total cost $4.00! $4.00 was a deal I could not pass up, so I placed my Oder and waited. According to my instructions I could complete the project in 20 minutes. I wonder if they timed it at 1:30am when you are hyped up on caffeine? Anyways, at first I had a little trouble getting my chosen cats to stick to the metal lids. Never fear, I used a lot more glue and called Pete. Pete told me to apply more glue and to hold them in place for a few minutes. 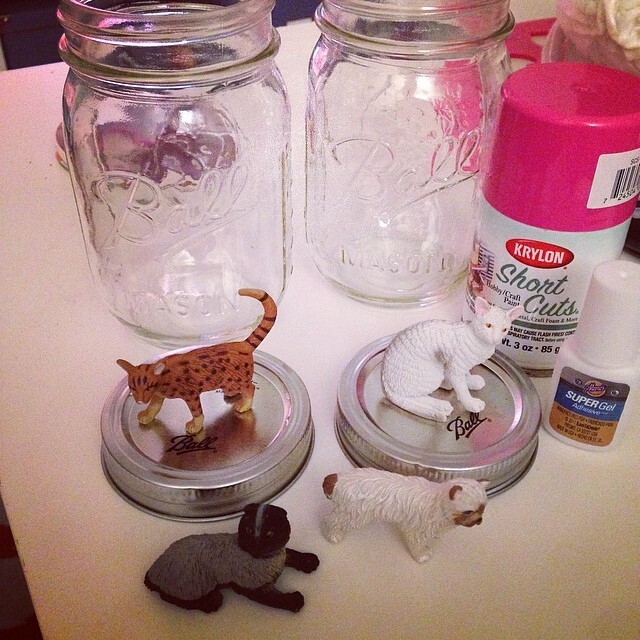 It worked the cats stuck and I set out to spray paint the lids. Score, I didn’t get any spray paint on my kitchen floor. That right there called for a 2am happy dance. Once the paint dried I realized that I did not paint the cats bellies and I missed an ear on one. With a second coat of paint they were good to go and I was ready to hit the hay. I said goodnight to my new painted friends and let them dry over night. 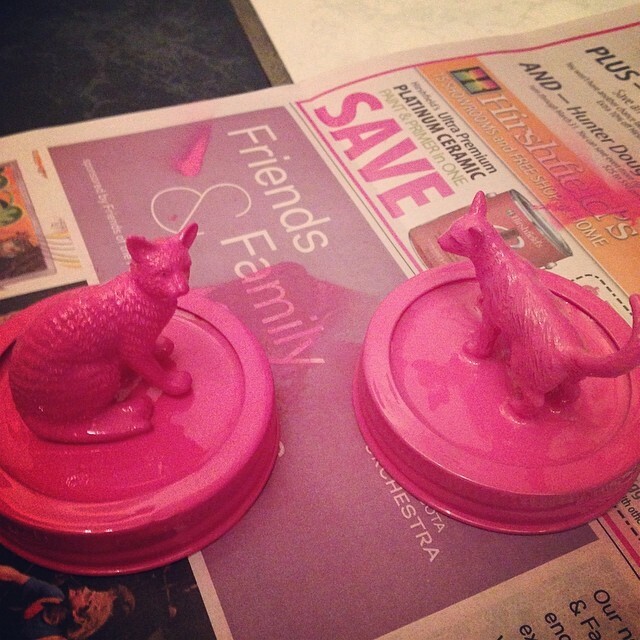 In the morning the looked great, all was covered nicely in hot pink paint and I was ready to slap them onto the jars. Ta da! 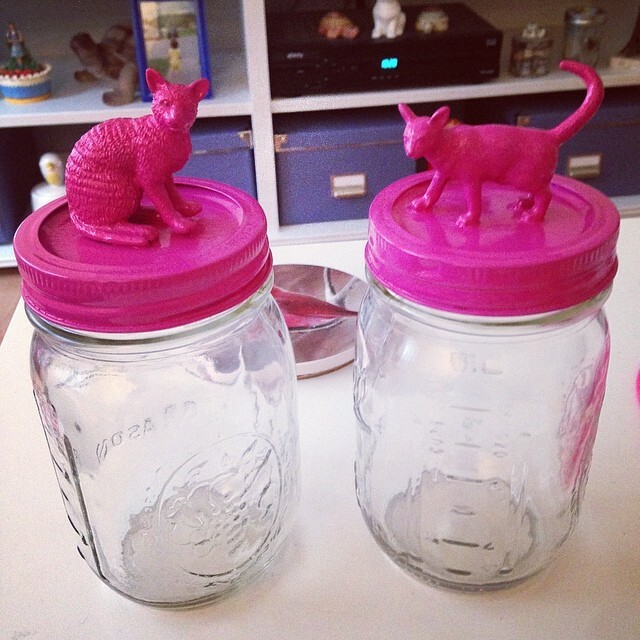 I am now the proud owner of two very whimsical jars and I am pretty darn happy with how this project turned out. If you are in need of internet rehab I command you to truck on over to http://www.darbysmart.com. Your DIY kit is waiting for you and remember to use the code HOWDYDARBY to get $10.00 off, yes I said $10.00 off of your first order. Have fun and DIY my friends.